Twenty-five years ago, hiker trekking poles were practically non-existent. Some hikers used a staff such as the one in the left picture. Most hikers used nothing. Back then, I would look for a suitable blown-down branch, use it for my hike, and discard it when I left the trailhead. Hiking Tip: Save your knees; use trekking poles. Today, all serious hikers use trekking poles. There may be a few holdouts, but their knees are at risk. The poles you see on the right have little plungers in them that act like miniature shock absorbers, saving your knees from the thud, thud, thud of going downhill. And trekking poles, sometimes called sticks, help drive you uphill. There are many other advantages to trekking poles. Pushing off on poles while driving uphill maintains your upper body strength, which can atrophy over months on a trail. Poles are the first line of defense against a wild dog, or if you ever get in trouble. Some hikers smack them on rocks in rocky areas to drive away possible rattlers. 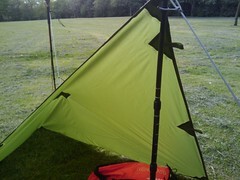 I’ve seen some hikers use length-adjusted trekking poles as tent posts. For me, a great advantage of poles is the stability they provide in crossing streams. I poke my poles to test underwater spots, then plant them with confidence as I cross via exposed rocks. There is growing concern that poles are causing damage to plants, especially above tree-line, or in alpine areas. To avoid this, some hikers apply rubber tips over the metal studs, or close down their poles where flora cling to life. Without question, trekking poles give hikers big advantages; that’s why everyone uses them. But the biggest single advantage is that they will save your knees. This entry was tagged backpacking, camping, hiking, long-distance hiking, mountain, thru-hiking, trekking poles. Bookmark the permalink.